Christmas photo cards are a great way to kick off the holiday season while sharing your favorite photos with family and friends. 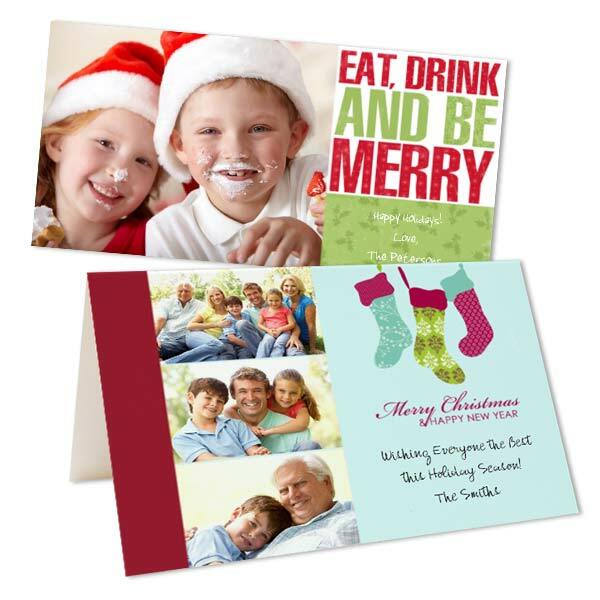 Create a double sided Christmas card or select our classic folding Christmas card that’s fully customized with your favorite memories and your own personalized holiday message. We have a large variety of card templates to choose from in a range of styles. From modern Christmas cards to traditional holiday greetings, we have the perfect template that is sure to fit the bill. Upload your photos from your phone or online and get your personalized Christmas card design started today! If you’re trying to decide on a photo to use for your photo Christmas card, you can browse your phone or laptop and upload a series of pictures directly to your MailPix account. Use a formal holiday family portrait on our folding photo greeting card, or create a collage and have it printed on our glossy photo paper card option instead. From wedding pictures to pet snapshots, you can create the perfect layout to feature your photos with a customized greetings. You’ll not only be spreading holiday joy this year; you’ll be sharing your fondest moments for a one-of-a-kind sentiment everyone will enjoy! In addition to Christmas cards, we have an entire collection of holiday photo cards, and Chanukkah greetings, that you can put your stamp on! Forget the hassle of hunting around local stores for the perfect holiday stationery! Create your own using your own photographic treasures!